It is highly resistant to both mechanical and chemical weathering. This durability makes it the dominant mineral of mountaintops and the primary constituent of beach, river, and desert sand. The offered Milky White Quartz Powder is highly used in production of Quartz slab, Glass, Abrasive Industry Also, the offered Quartz Powder is available in various packaging options to fulfill the varied needs of clients. 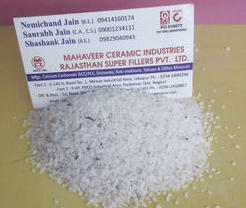 Rajasthan Super Fillers Private Limited, Rajasthan, India became an affluent manufacturer, exporter and supplier of Milky White Quartz in Udaipur, Rajasthan, India. We are providing a premium quality range of quartz powder and grains. We grade powder by granulation and sizing.